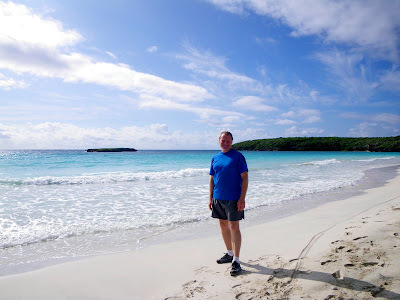 Jeff needed to use up some vacation time and after getting good advice from our blog viewers we decided to go to Vieques as our first little mini excursion. After reading trip advisor, researching the ferry and attempting to talk to them I was very frustrated and not happy. For the last month I have been dealing with CRIM and Hacienda, Puerto Rico Wire didn't have trimmer line, and I was selecting tile for the last 6 days and had the dirt that comes with redoing a bathroom floating around the house along with 2 strange men. I read about them not selling tickets until the hour before sailing, about people getting in line for hours ahead of time and after waiting there being told they weren't gonna get on because they took locals and people who mysteriously were able to make reservations on at the expense of everyone else. I wasn't in the mood. Sure it was $4.50 with $5 parking, but for a 2 night trip like ours I don't want to waste time and get irritable doing it! 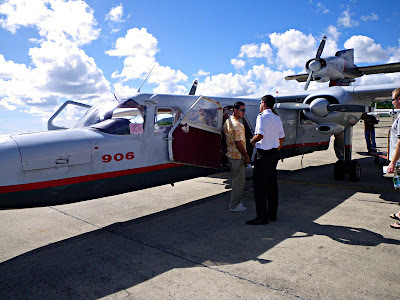 Instead of the ferry we paid 44 bucks each round trip to fly over there on Vieques Air Line - no waiting required. On demand flying. It was a skinny little plane like Snoopy's doghouse and I had to turn my knees to the side the fit. You drive to Ceiba (before Fajardo), walk in, give them your name (we did call ahead and got a talking person), give them money, wait 10 minutes, fly ten minutes and get off! Sooooooo eassssy! My god it was great! Then there was a publico that brought us to the hotel for 5 bucks each on the other side of the island. 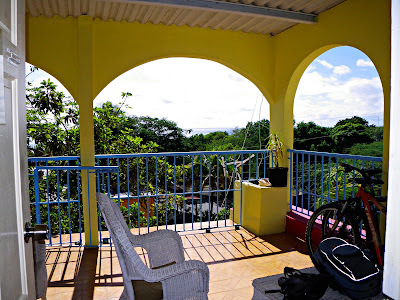 We stayed at Casa AltaVista. I had read reviews on Trip Advisor and it sounded good. The nice things were that we had the place to ourselves until late Thursday night...our little deck was nice, the walk to town was short but we were far enough away to not hear drinkers/partiers. The front office people were super nice and helpful and confirmed our little trips, arranged the publicos and were genuinely nice. The bad things were -1 the uncontrollable - a rude group of 30 something Puerto Rican guys came in late, hooted and hollered and basically were yelling for a few hours and we had to talk to them a few times to get them to abide by the quiet at 11 rule. The hotel resolved this the next night. A piss off point for me was that for $85 a night (2 nights) they never came in the room or gave us new, dry towels. We went to the biobay bay the first night and biking first thing the next morning and when we got back had to use the beach towels we brought to dry off. I'm sorry - that is just stupid and inexcusable! We got more when we asked, but we don't want to ask - we want them to appear!You can't fix other people but CAN put towels in rooms! So I don't know how much other places cost or what their problems were but if we were to return I'd go somewhere else and ask more questions. The publico got us in at 1:30 or something so we rustled up food and then at 5:30 headed to the meeting place for the biobay tour. Many operators do this but we went with Abes Snorkeling (which we found out after the fact is who the Sierra Club uses for their trips). We had fins, snorkels, masks and I wore a 2mm wetsuit. I picked these dates for our trip based on the moon (or lack of). It was perfect for the biobay thing. We have seen a lot of bioluminescence but nothing like this! It really was spectacular.We got a lot of good information (this is the world's largest and brightest biobay) and we got to swim around and it was a bright as light bulbs! I couldn't photograph it but it looked exactly like what is on the www.biobay.com website. There were a few other small groups out there (this was on Thursday). We found out later is that you aren't allowed to swim in the bay and are supposed to just float in your kayak or canoe. 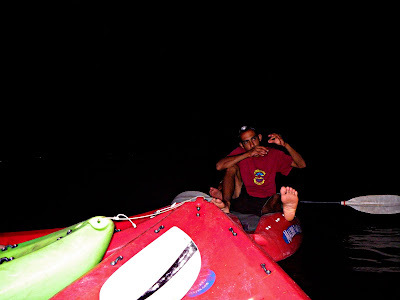 There is a guy (the guy we biked with) who is buying clear canoes that will make the biobay tour wonderful. It is in Mosquito Bay which is named that for a reason and still, people wore bathing suits - I don't recommend that! So we swam, since we had masks and fins we could dive down and hear all kinds of manta shrimp clicking away. The stars were fabulous...the sunset was nice...something everyone who lives here really needs to do. We were taken by surprise by how good it was (we have seen a lot of stuff). Back to the hotel for a shower and sleep - biking is at 7:30! We meet for biking and the guy comes, all apologetic....he has got to pick up a shipment of clear canoes that have just arrived or they start charging him big bucks to keep them with the shipper. He has to reschedule or cancel. He ends up giving us a couple bikes to use for the day, tips on where to go, how to use the bikes (we haven't ridden before) and we will meet up at 7 the next morning for the guided thing. This works out just fine for us. 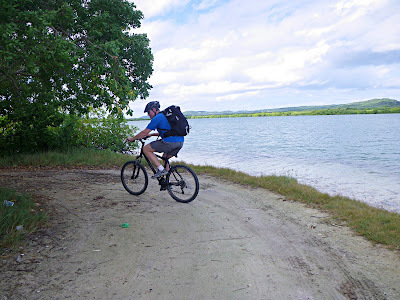 We hop on the bikes and head out to the Natural Resources land that end up out on the beach. The first beach is Playuela. A very nice sandy beach. This whole week has been less than perfect weather and the water was a little rough for snorkeling. We stay awhile and then hop on the bikes to another beach...we end up at Tres Palmitas. We went 10 or more miles and it didn't feel like it. We saw some new areas of the island (we didn't rent a car). Then it was off to lunch and into the water to snorkel. Snorkeling wasn't good. We dive and there just wasn't anything there. The Navy used the island's waters for bomb testing and didn't leave the island until 2003. The reefs were blasted and who knows if things will recover. We had a very nice action packed day. We went to Quenepa restaurant and had a really nice meal -fish prepared properly (I had seared Ahi on a little bed of salad and we had cream/cheese/crab tempora sushi with salmon on top. Yumm. Then a molten lava chocolate thing for dessert - I always love those. The presentation and service were really excellent. I'd go there again in a heartbeat!